You know, one of the best types of optical illusions, in my opinion, are afterimages. Basically, an afterimage optical illusion is when you stare at something for a certain period of time and it will mess with your perception or you will even continue to see the image after you have looked away. I realize that I haven’t posted an afterimage optical illusion in quite some time, so I decided to post one up for all of you to check out today. Now, this one is definitely going to mess with your mind, so I’m excited to show it off to all of you. I have dubbed this optical illusion as the larger letter optical illusion. © Gianni A. Sarcone, www.archimedes-lab.org. All rights reserved. Did this optical illusion work for you? Basically, you’re supposed to stare at the + symbol in the “B” diagram for 30 seconds. 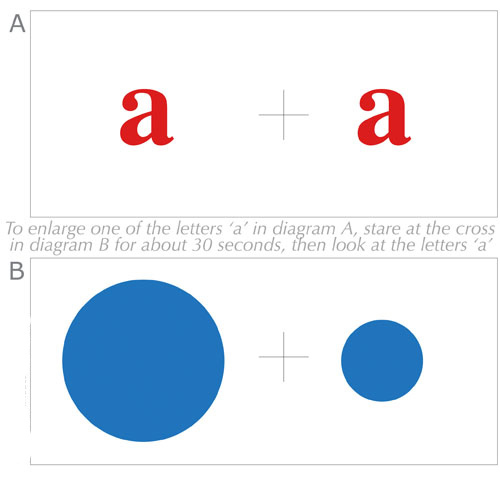 After you’ve stared at the image for 30 seconds, you can switch your focus to the + symbol in the “A” diagram and the letter “A” on the left side should appear to be bigger to you than the letter “A” on the right side. In other words, it gives off the illusion that the letter has actually grown in size. If this illusion worked for you, you should leave a comment in the area below and let us know. Also, feel free to rate this illusion and let us know what you think. Lastly, if you want to impress your friends, you can share this post with them. I bet it will definitely trip them out! PS : sorry for my english, I’m french ! Doesn’t work for me, I tried several times. But nice concept.